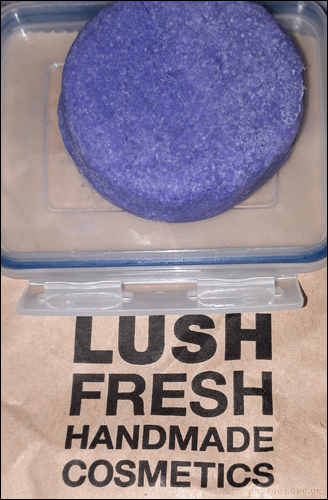 Previously only available online, I discovered the Jumping Juniper shampoo bar in my local Lush store recently, and decided to give it a try. I’ve been using New! and Montalbano most frequently, but decided my hair deserved a change. 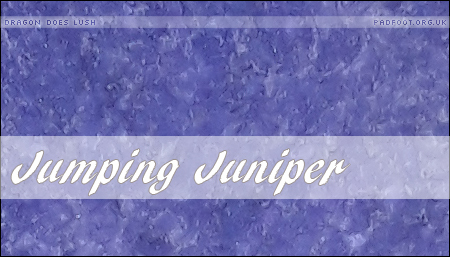 Made with a Rosemary and Lavender infusion plus Juniperberry oil, Jumping Juniper has a relaxing aroma, which I spoilt slightly by having used a Whoosh! shower jelly before washing my hair. The shampoo bar lathers up easily, which is a real bonus for my long thick hair. Lush say that the Juniperberry oil in the shampoo bar works to give hair a deep clean, which I can definitely agree with – where some shampoos can either make my hair dry, or feel like it’s weighed down, this one actually made my horribly greasy hair feel perfectly clean, without being flyaway. Previously, I was told in the store to expect a shampoo bar to last for between 40 and 60 washes. Personally I’ve never achieved that yet, but I think the thickness of my hair has something to do with that. When I get to the point where the shampoo bar breaks, one of my housemates with shorter hair usually calls dibs on tidying up the pieces! This entry was posted in Lush, Shampoo bars and tagged Jumping Juniper, Juniperberry, Lush, shampoo on October 11, 2018 by Dragon.